You need to understand that people are getting arrested for breaking these laws. Below, I have a story of what happened to a few. There are more stories like this in my files. Do not break these laws. Here is a story that was told to me by three individuals who were detecting in Maine. The three men were detecting along a the edge of a local street. After ten minutes they were approached by a local Sheriff. He asked them to put down their metal detectors and to empty their pouches and their pockets. The three men asked why they were being asked to do this and the Sheriff told them they were breaking the law. When the men asked to know what law they were breaking the Sheriff handcuffed all three men and escorted them to the local jail. Still not knowing what law they had broken, when they arrived at the local jail one man asked to make a call to his attorney, who happened to be his brother-n-law. The brother-n-law showed up twenty minutes later with the local Judge. The Judge explained the men broke the National Historic Preservation Act Law (NHPA). Apparently the men were metal detecting on a piece of historical property. The three men had their metal detectors confiscated and they had to post a large bond for a future court date. I have not heard of the results from that mis-adventure. So in addition to the ARPA Law, in maine you need to follow the NHPA law. The NHPA law in Maine. As confusing as the above laws may seem, do not dig anything that you believe is an artifact, or anything that is older than 100 years. For metal detecting in Maine town, village and city parks, you'll need to check with those local officials. This page has more information regarding the ARPA Law, and much more. If you would like to help and be a part of the solution to stop the increasing amount of unconstitutional laws against the hobby, then visit WWATS. If you are interested in a metal detector or accessories please visit my online store. 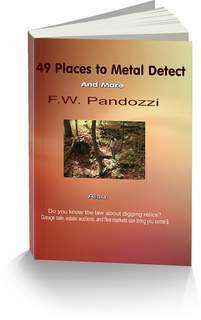 Have you tried metal detecting in Maine ghost towns?